The enlarged 'Sixth Edition' Bernwode Fruit Trees printed catalogue is available to order, by post (with cheque) or by telephone (with card). Inclusive of postage it costs £5.00 (overseas locations £7.00). If collected from the nursery the cost is £4.00. 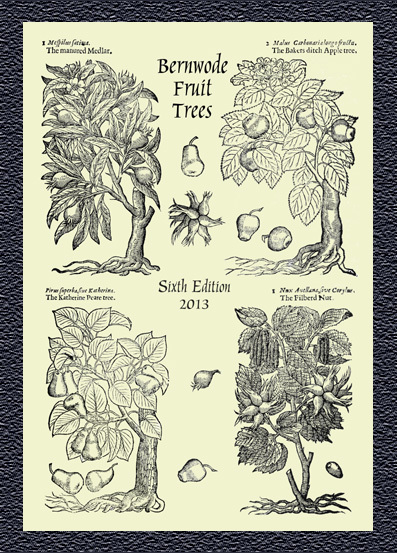 The 100-page printed black and white catalogue contains descriptions and interesting historical details of over 700 traditional and rare varieties of fruit trees and soft fruit, along with helpful details on growing, pollination and rootstock choices. There are over 500 apple varieties included. It is more a reference work than a nursery catalogue. It now comes with a large, but unbound, supplementary update for extra varieties now available. While we are happy to send the catalogue anywhere in the world, it should be noted that we do not send trees outside the UK, due to increasing costs and restrictions imposed by governments and the European Union. Compared to printing off details from our website, with the resulting volume of paper, cost of inks, power and time, the printed catalogue is, by far, the greener, more convenient and cheaper option.